Oh friends. I don’t know what to say. Just kidding. I totally know what to say. I found a killer bread recipe. Every few years I get the craving to make my own bread. I can’t say that I make my own bread on a regular basis because it really does happen every few years. Today I skimmed through the internet and read a few recipes. The one below stood out because of its use of evaporated milk. I’ve never heard of a recipe that called for that bit of goodness. 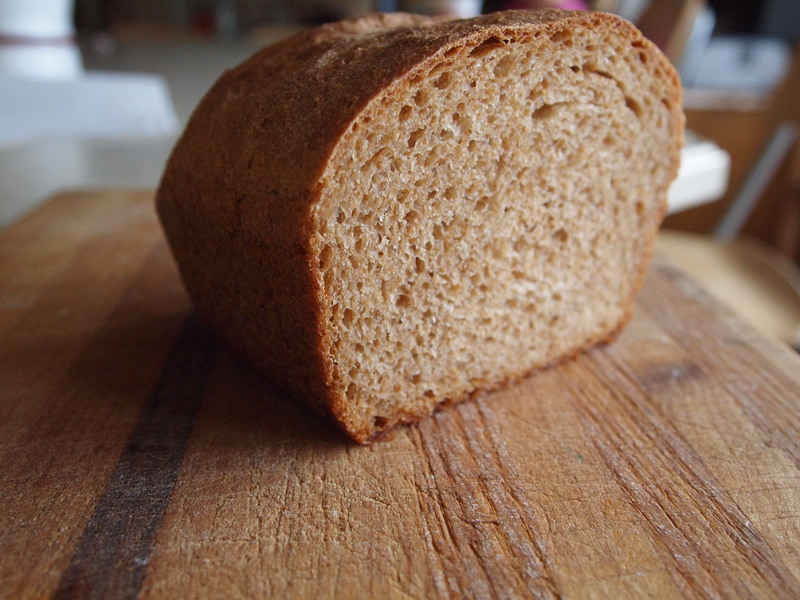 Another interesting part of the recipe was the advice to let the moisture absorb the whole wheat flour. Fascinating. The very best part of this recipe was how beautiful the bread cuts. The biggest pain about homemade bread is that it falls apart and feels…well “homemade”. I want my bread to taste homemade but feel store bought. Does anyone out there know what I’m talking about? The crumb in this bread was absolutely perfect: firm yet moist. I just loved it. Make it and you’ll be as happy as I am. 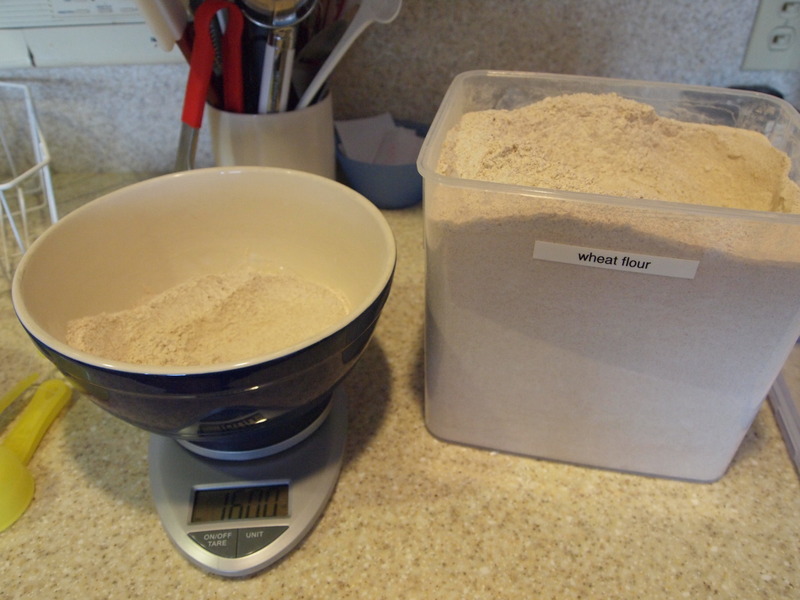 When baking bread, the best weigh to measure flour is by weight, not by cup. Add hot water, milk and honey to bread machine can. Add salt, wheat flour, white flour, and yeast. Set pan in bread machine and select “dough” setting. 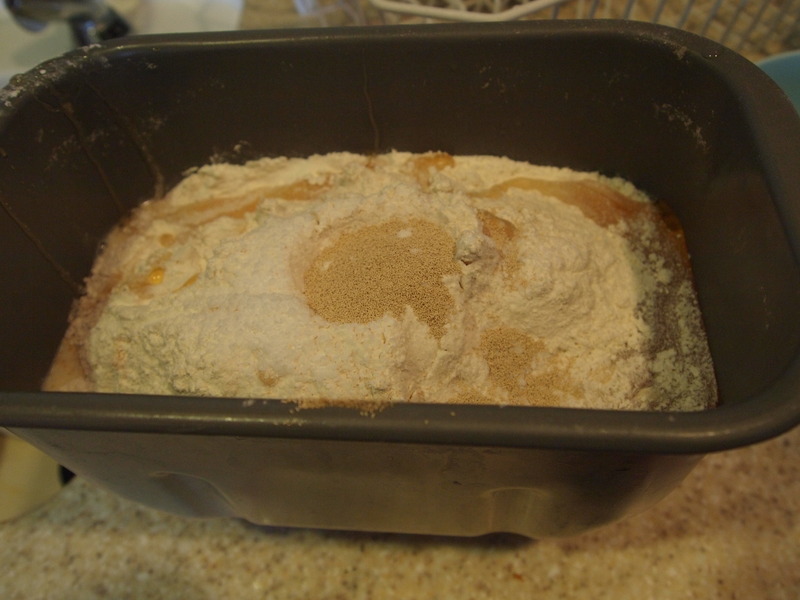 When complete, divide dough evenly between two well oiled bread pans. Allow dough to rise while preheating oven to 425. Once oven is preheated, put both pans in and immediately reduce oven to 375. Cook loaves for 45 minutes or until brown on top. When done, remove from oven. Take loaves out of pans and let them cool and cooling racks. Add the milk, honey, salt, yeast, and bread flour to the original mixture and mix until well combined. Add additional flour and knead by hand or in a stand mixer until a tacky but not completely sticky dough is formed. Place the ball of dough in a well-oiled bowl, cover with plastic wrap, and set aside to rise for 60 to 90 minutes. Oooh! I can’t wait to try this! I know EXACTLY what you are talking about! Thanks for sharing!